The Creator stood back to admire his work. The perfect little orb hung in the sky, with all its jewel-azure oceans and towering mountain ranges; with its belts of steaming rainforest and swathes of sand shimmering upwards into the depths of velveteen space. And most wonderful of all were those humans. They even looked like the Creator. They would sit in their beautiful gardens and talk to him of an evening, when the bold young sun was disappearing behind the mountains. He loved to see them happy, and they kept him company. But as time wore on, the sun’s rays were not kind to the people. Their skin began to wrinkle, and their bodies refused to do what they once did. Age had shown its face in the garden of Eden, and the Creator set about finding a solution. He tinkered in his workshop for many long hours, as his new bauble turned again and again, catching the sunlight. And finally he emerged. He had the solution. But he needed to get it to them quickly and as one would expect with the Creator, he had a packed schedule and his PA was insistent he should honour each and every engagement. So the Creator sent for his go-to guy, the most fleet-footed of all his creatures, the Chameleon. The Chameleon was a really lovely chap: good conversationalist, great sense of humour, all-round nice bloke. The Creator could not suppress an indulgent smile as his small scaly knight stood in his presence, ready to carry out his commands. He took the package. And suddenly there was no longer a chameleon in the Creator’s presence, only the remains of an indistinct streak where he had once been, and the chameleon was half way across the Solar System, making for that beak-nosed breathtaking African continent , all golden and green where he knew the people loved to stay. He paused at the river about an hour’s run from the peoples’ garden. Being the Creator’s Knight was thirsty work. He stopped to drink at a great river and the water was cool and sweet and he sighed, gazing at this wondrous place and he offered up silent thanks to that Creator of his. “Hello, Chameleon,” rasped a dry voice. As much as Chameleon tried to like Snake he found it hard. There was something grasping about the creature. And no legs. 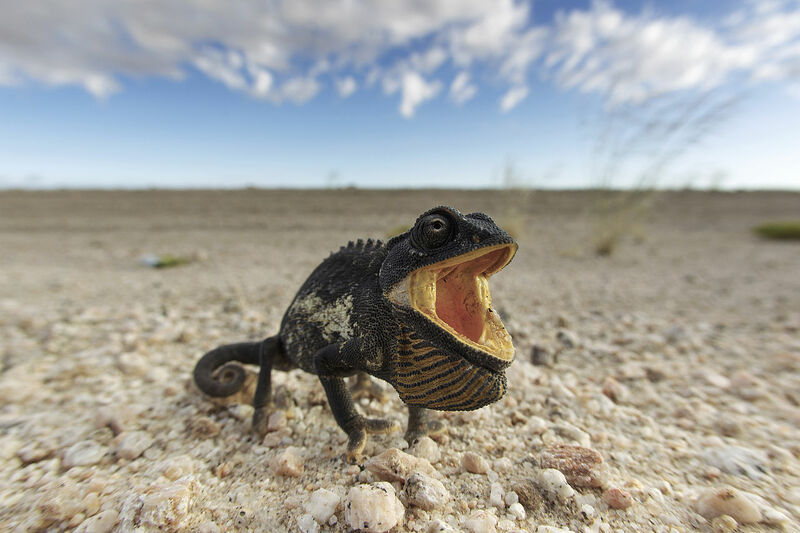 Chameleon shuddered, and then collected himself. “Hello, Snake,” he smiled cordially. “I shall pop over very soon for a dinner, Snake,” he promised reluctantly (for Chameleon is a reptile of his word). It was Chameleon’s weakness. He was such a nice chap, he found it difficult to say no. Yet in the middle of this crucial errand it seemed to taunt fate. After an eternity in an instant, the Chameleon accepted. Inside were perfect new skins. Flawless. The Chameleon protested and tried everything but the Snake was stronger. It was the first lesson on this twinkling globe of ours that life is unfair, for the Creator could have redressed the balance, but he did not. To this day, when the snake is looking old and washed out, he gets a new skin, whilst the humans shrivel, year by year. He was mortified. So much so he will never travel fast again, but clings to the branches of trees, hiding from the Creator he reveres, a disgraced knight. Spare a thought for him, the next time you see him in his self-imposed exile. And perhaps you might tell him: the Creator would love to give him a hug. Written in response to Side View’s challenge, Chameleon, which you can find here. Posted in Folk tales, Side View's ChallegeTagged chameleon, folklore, stories, Zulu folk taleBookmark the permalink. Poor chameleon, we love them over here. You have to feel sorry for him, don’t you, Sidey? It has been a busy day, apologies: I shall pop over to yours with the link shortly. Very neat story telling, Ms.Kate Kipling. Love it. Thanks Elspeth. Loved your post on Edinburgh. Made me want to get on the first plane up there. Wonderful story, Kate. I read it to June, and she loved it as well. I have told you many times that you have a great storytelling gift. Love this. What a great story you tell. Hi Joss! Thank you so much. The story is an old Zulu folk tale. The idea of a chameleon travelling at great speed appealed. Hello Elaine 🙂 So glad you enjoyed it. The old tales are often the best…. That wretched snake again! Poor chameleon, poor humans… Very inventive, Kate, and beautifully told. Thank you, Ruth! The snake gets it in so many cultures, doesn’t it? I must find a tale where the snake is a goodie. Snakessss. They’ve had it in for humans from the beginning, haven’t they? Poor chameleon. I don’t hold him responsible. He was just an innocent third party. I know. But stuff hapens, and sometime it’s beyond your control. Clever of the Zulu tribes – who came up with this tale – to find a way of saying it so well. Great story Kate and I love the image that you found to accompany it! Isn’t it fabulous, Tammy? Wikipedia too. I’d like that one on my wall…. So now I know whom to blame for giving me wrinkles. Fabulous! Always talented, you outdid yourself with this chameleon of a story, Kate. A most enjoyable fable. Colorful as that cameleon who so reminds us of ourselver. Well done, Kate. Thanks – and you have hit the nail on the head, Jamie: so compassionate, that chameleon, yet flawed like us all. Good thing the Creator has a plan B. As all of the others have said, Kate… fabulous story! Thanks, Tom. It’s the Zulus, really…. And that’s a very cool pic! Cleverly told, Kate. Zora Neale Hurston turned many of the tales she heard into folktales. I’ll bet she would have loved this one. I do. I’m officially impressed, Kate! This is a fabulous tale…and one I won’t forget. Life is yes, unfair. Aging has a way of reminding me this all the time…we gain wisdom at the same rate we lose our youthfulness. And now I know why! Bravo! So THAT’S why I get so wrinkly when I leave Hawaii (we have no snakes or chameleons in Hawaii. It’s a special world). Wonderful story told, Kate. Now I hate snakes more than ever! !